Economic growth per capita looks at the average increase in real GDP per person. We could have economic growth of 3% a year. But, if population growth is also 3%, then average incomes – Real GDP per capita will remain the same. If the population declines by 2% a year, but real GDP increases 1% – then that is an effective increase in real GDP per capita of 3%. It is important to take population into account because it gives a better indication of how the average person is affected by economic growth. In recent years, the UK has seen a rise in population – with population growth of approx 0.6 – 0.8% a year in the past few years. Therefore, with population growth of just under 1% a year – real income per capita are increasing at a slower rate than the headline real GDP statistics. A useful guide to living standards is real household disposable income per head. 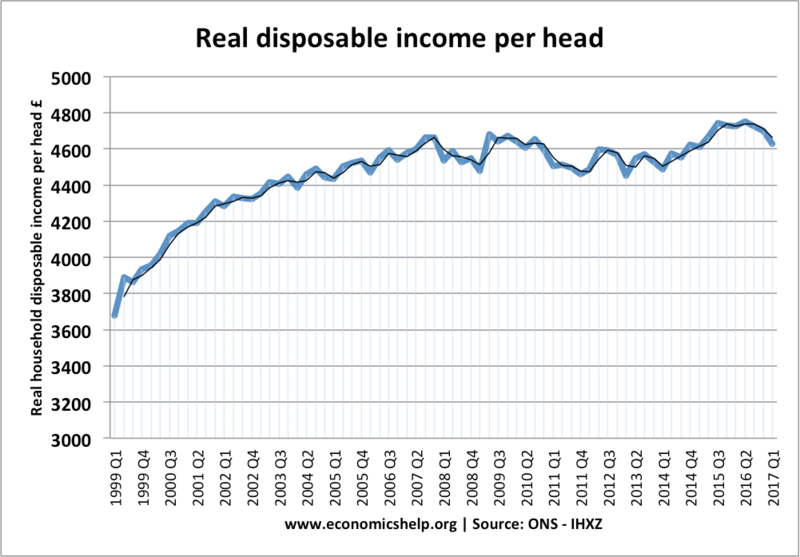 Real disposable income per head since 1999. Real household incomes per capita fell from 2007 to 2014. This quarterly figures show an improvement in real disposable income per head during 2015. But, real incomes per capita are still lower than 2007. Another series shows real GDP per head. 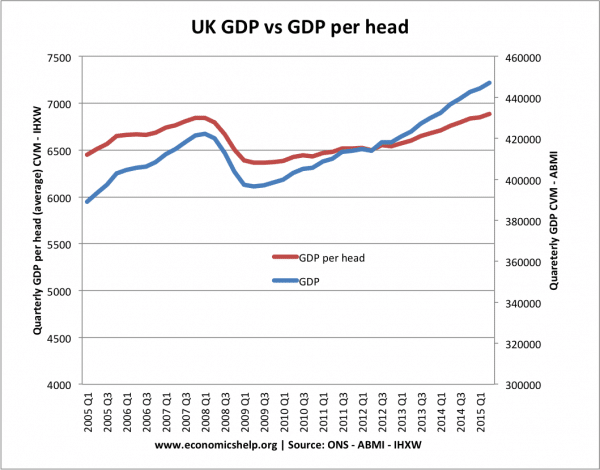 This shows real GDP per head has just caught up with real GDP per head in 2007. 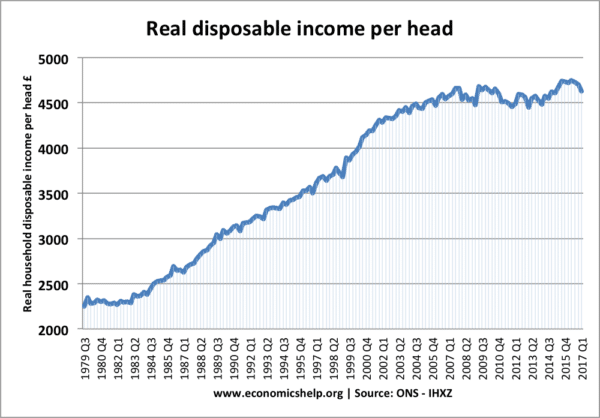 Note: real GDP includes real household incomes, but is also composed of others, such as rent, profit and dividends. 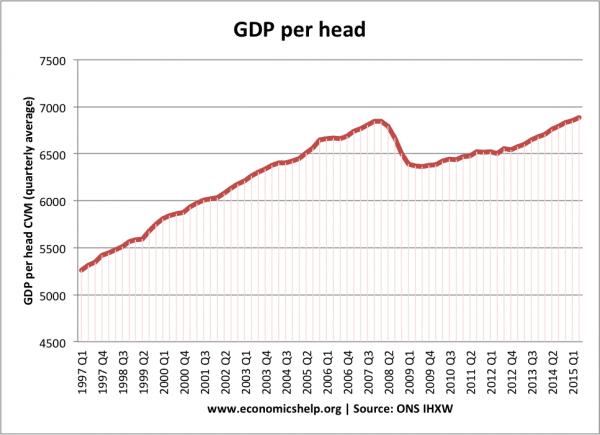 Headline figures of economic growth can give a misleading impression of living standards. 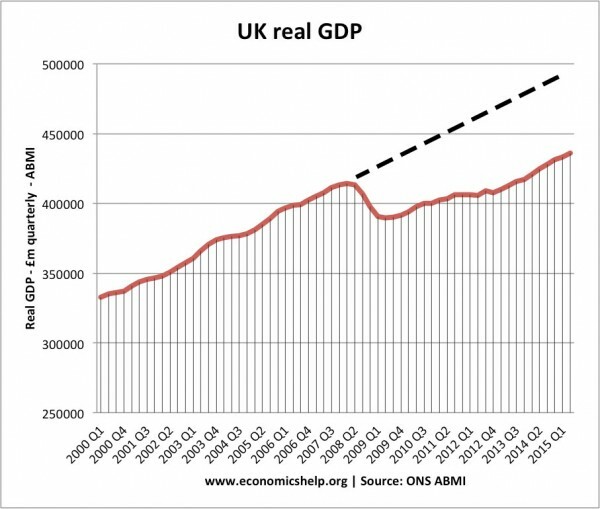 If you increase the population, real GDP will invariably rise, but this on its own doesn’t cause rising real GDP. When comparing rates of economic growth between countries, the most useful comparison is to use real GDP per capita.